Five avid VGM vinyl collectors wax lyrical about their passion for game music and soundtrack records — and offer crate-digging and tech tips for beginner hobbyists. We chatted to ardent collectors Frederik Lauridsen (AKA Blip Blop AKA rpbtz), Michael McCartney (who runs the Games on Wax Twitter feed), and the crew from the Video Game Grooves podcast — Messrs Jeremy LaMont, Paul Watson and Anthony Agnello — to find out what drives their love of gamey wax and what their wallets ever did to them to deserve such persistent punishment. ‘Video game music’ is often abbreviated to ‘VGM’. ‘Vinyl’ (a singular ‘piece of vinyl’, ‘vinyl record’ or ‘vinyl’ plural) is often fondly referred to as ‘wax’ or simply as a ‘record’. A full vinyl album is an ‘LP’ (long-player), whilst a 12” or ‘12-inch’ is a single or EP (four-ish songs). You will often see two or more disc sets described as ‘2xLP’, ‘3xLP’ and so on. A vinyl record player is more commonly known as a ‘turntable’. ‘OST’ stands for ‘original soundtrack’, i.e. music composed especially for a given game, rather than licensed from an external source. ‘Chiptune’ is a catch-all term for video game music where programmed notes are voiced by a console or computer sound chip; the original chiptune era runs from the early 1970’s to the mid-1990’s, but there is also a more recent nostalgic, revivalist movement where musicians aim to recreate the chiptune sound through software (or using old hardware). ‘Red Book audio’ means CD quality digital music (stereo, 16-bit, 44,100 Hz sample rate); it became available in video games once game-playing machines became disc-based. These five collectors were drawn like moths to multiple flames: to video games; to in-game music; to soundtrack releases; and eventually ending up as certifiable VGM vinyl-heads. Their individual journeys usually required an ‘ah-ha!’ moment — a dawning realisation that game music was its own medium, and that there was a niche within a niche, within a niche (game music on vinyl) that catered to audiophile fans. Co-host of Video Game Grooves, Paul Watson, is up front about his passion for games and games music, as well as the industry underpinning it all: “Video games have shaped my life and my career. Of all the entertainment industries (film, music etc. ), it feels like only games are still evolving at a rapid rate, and I find that very exciting. Blogger Blip Blop came to the hobby from a different direction: as he explained last year in his piece for Laced With Wax on his passion for vinyl, he went from being a serious CD collector (whilst working in a record shop) to being a super serious vinyl collector. And while he is an authority on video game vinyl and a man in the know about seemingly all upcoming releases, his video game wax only comprises less than 25% of his overall collection of over 1,300 records. “It's becoming a bad habit, haha,” he jokes, in a decent impression of the King of Understatement. He remembers employing workarounds to obtain game music on an external format, recording in-game music to cassette tape to enjoy later. Collecting soundtracks was the obvious next step: “My first CD was the Sierra Soundtrack Collection (YouTube; VGMDB), which featured instrumental versions of tunes from many beloved adventure games of the day. Agnello also points out the inherent problem with talking about VGM as a singular type of music: “Video game music is such a hard beast to classify. It's like referring to electronic music as a genre unto itself — the term is way too vague to give you an accurate summation that actually encompasses it. Blip Blop is buoyed by this fact: “What keeps me going now is the variety of music under the VGM umbrella. There’s a wealth of music genres found within games but, even though they’re varied compared to each other, they still have to fit a particular game’s style and atmosphere. It took a while for podcaster Jeremy LaMont to become an out-and-out collector: “I'd been aware of video game music on vinyl records for quite a while before I took an active interest. I was intrigued by the 2009 vinyl release based on Marvel vs Capcom 2 (OST – YouTube; Hip Hop Mixtape vinyl – Discogs) as a Comic-Con exclusive; also by a limited edition vinyl of one of my favourite soundtracks of that year, Shatter (YouTube; Discogs). At the time I treated them mostly as oddities and didn't pursue them — Marvel vs Capcom 2 still eludes my grasp, but I finally got hold of Shatter this summer! Blip Blop started his VGM collection in earnest around the same time as LaMont: “I'd already bought my first few VGM vinyl and realised more and more releases were being announced, including for really cool games. “It struck me as seriously fantastic that someone would source music from old hardware, remaster it and put it out on vinyl. That’s amazing dedication, and something I wanted to follow more closely. Around that same time, I started looking out for what had already been released and trying to find (and ultimately create) one place to keep this information — what is now Blipblop.net. Like Blip Blop, Michael McCartney came to VGM vinyl as part of a wider record collecting hobby: “I started my record collection around 2011 with vinyl from the likes of Daft Punk and Amon Tobin. “When I learned that video game soundtracks were being released on vinyl and not just on CD, for a long time it baffled me. I’ve always been interested in novelty records and hidden gems, so I picked up a few things like Scott Pilgrim vs. the World: The Game (YouTube; Spotify; Discogs) and Street Fighter II (YouTube; Discogs). I figured there might be a few more, but not hundreds — and now it has blown up in parallel with the vinyl revival. How long until there are over a thousand releases out there? Paul Watson admits that he wasn’t as sonically motivated as his collector colleagues when his record collection began to take shape: “I still cringe when I think about it. During my university years, I bought a whole bunch of vinyl for the sole purpose of hanging them on my wall… But it gets worse... it was mostly Blink-182! 😳 It wasn’t until several years later that I decided that, instead of decoration, I ought to be listening to my records as intended. “At the time, there weren’t really any vinyl records featuring contemporary video game soundtracks, besides the older G.M.O. records of Sega music from the 80’s and a few others. With that in mind, I resolved to pick up any and all VGM on vinyl that I stumbled across. I wasn’t prepared, however, for the massive influx of releases that we’ve seen since. As with his podcasting pal Mr LaMont, Anthony Agnello grew up in a house full of vinyl, despite being a “CD generation kid. My parents preserved most of their 1960’s-80’s collection, but sadly I didn't truly appreciate the bounty until I was a teenager; almost the entire collection of original Beatles, Rolling Stones, Stevie Wonder etc. records were destroyed in a basement flood. “Thus my first video game vinyl was a humdinger: Symphonic Suite Dragon Quest II (YouTube; Discogs). “Hunting for vintage VGM vinyl from Japan has never been easy in the US, so it felt like a victory to find one at all. But this one in particular bears all the hallmarks of its time: there may be a symphony orchestra playing those sweet, sweet Koichi Sugiyama tracks, but big ol' synths blare up in the middle reminding you that yes, it was made in the '80s. The crown jewel of Agnello’s game vinyl collection, Symphonic Suite Dragon Quest III (YouTube; Discogs), is only a step away from his first VGM record: “This one has always been more sought after than Symphonic Suite Dragon Quest II, and took forever for me to find at an affordable price. Paul Watson’s favourite wax was a special gift: “For my birthday last year, a couple of friends from Square-Enix gifted me a copy of Life is Strange (YouTube; Discogs) on vinyl — a promotional item that was originally made to send to press. And as for Jeremy LaMont: “I've successfully nabbed a few ‘chase’ releases for my collection recently, including Shatter, Scott Pilgrim vs the World: The Game and The Last of Us, but the one I never thought I'd land was Life is Strange. Whilst Blip Blop is fond of his treasured Red Dead Redemption album, his personal favourite is the Final Fantasy Vinyls 5xLP box set (Discogs): “This is principally down to my love of all things Final Fantasy, rather than the actual vinyl package itself. It was released in commemoration of the 25th anniversary of the series, only in Japan, and features a selection of Nobuo Uematsu’s music from all the games between the original and Final Fantasy X. “For me, it’s a trip down memory lane to put this on. It’s not a perfect release by any means — the sound quality isn’t amazing and it has ‘VINYLS’ in big letters on the front — but it’s one that means a lot to me because it’s effectively a compilation of childhood and teenage gaming memories. VGM vinyl releases wouldn’t be half as attractive if they didn’t feature big, beautiful pieces of art, either drawn from a game’s assets, key art or concept art; or custom designed artwork commissioned for that release. 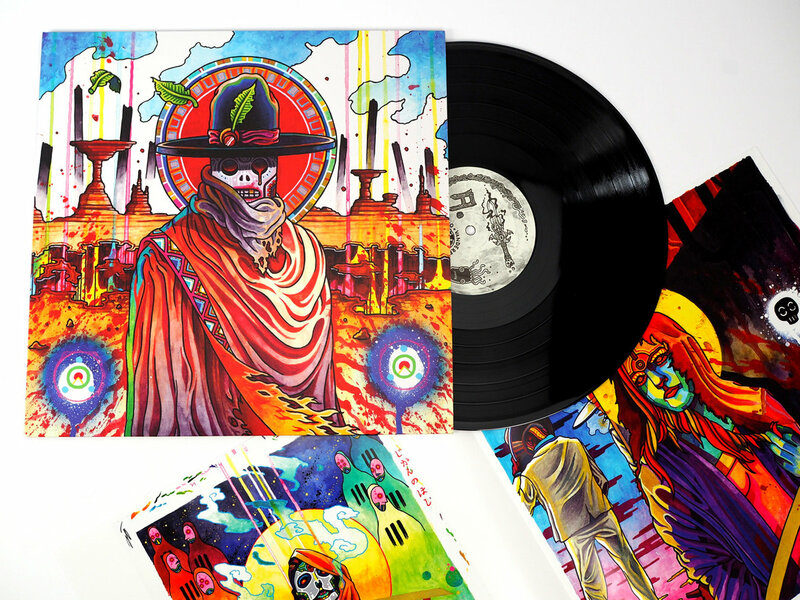 One of Paul Watson’s favourite contemporary artists happens to be regular Laced Records collaborator, Niklas Åkerblad, AKA El Huervo. Watson recalls: “I first became aware of him through his artwork and musical contributions to Hotline Miami. and you can buy the second pressing of the 3xLP Hotline Miami Collector’s Edition Vinyl and the 2xLP of Austin Wintory’s score to Absolver at Lacedrecords.com. Blip Blop, in trying to identify a favourite vinyl artist/illustrator, adds the caveat: “I’d likely change my opinion depending on the day of the week. Most game music labels have been really good at finding great artists to create new original artwork — or in some cases used original game art or promotional art to create a beautiful package for the records. For Anthony Agnello, it’s no contest as to his favourite vinyl art: “Akihiko Yoshida's cover for SQ Trax (Discogs). It’s probably the only vinyl I own purely for the sleeve art and not the music because, frankly, these are some of the worst dance remixes of RPG music I've ever heard! LaMont points out that his VGM vinyl hobby has, in some ways, overtaken his gaming: “I'll frequently seek out music from a game that I like. But for me the weirder (and more difficult to explain) scenario is where a vinyl record is released and I'll buy it on its own merits — and then try to play the game later to get some context. To some extent, collecting VGM vinyl has become a case of the tail wagging the dog. Blip Blop is humble in his acknowledging the privileges of his position as the VGM vinyl maven — producers will often make sure he is the first to know about new releases. “I’m really, really lucky because before I play a game, I’ll know with 99.9% certainty if a game’s soundtrack is either available or has been announced on vinyl. “Recently, it’s been more the case that I’ll get a VGM vinyl, really enjoy it and then decide to give the game a go, for example with Earthbound (AKA Mother 2 – YouTube; Discogs) and SNATCHER. Despite the seeming deluge, every collector has a list of game soundtracks that they’d chew off their right arm to see on vinyl. And on top of that list? Unsurprisingly for Anthony Agnello, it’s the JRPG: “A box set of the complete Chrono Trigger soundtrack is my dream release. One day…” Square’s seminal 90’s classic also topped an informal poll of favourite JRPGs as part of our article: “We ❤️ JRPGs: Favourite games and tracks of the game music community”. Turntables. Arms. Needles. Amplifiers. Speakers. Large shelves. Tolerant housemates. Vinyl is a hobby that can require a pretty little mound of technology, time and space to enjoy. Our collectors have a few sage tips for those just starting out. or some of Pro-Ject’s cheaper models. Blip Blop has dedicated a page of his website to getting people started with their setup and record collection, although he warns that the price suggestions on equipment haven’t been updated for a while. There is no shortage of resources for VGM vinyl hunters. and VGMDB.net is dedicated to game soundtrack (and other related) releases. Jeremy LaMont adds: “I've subscribed to TheReginaldProgram on YouTube, which is essentially a collection of line-in recordings of a very good quantity and variety of VGM vinyl. On cue, co-host Agnello enters plugging mode: “Ah, Video Game Grooves — that lovely podcast is a fount of information for collectors and it's mildly entertaining to boot."